Organizations are pushing forward in their digital transformations and we continue to see and hear more about what this shift means for IT. The scope of digital transformation goes beyond moving existing work to the cloud and enabling a more mobile workforce. It brings the opportunity to reimagine business from the ground up – from product offerings, to customer engagement strategies, to how to drive innovation and differentiate vs. competition. As a result, today more than ever, CIOs are being asked by their boards and other executives to weigh in on a growing number of business decisions. Almost half (46%) of CIOs in the State of the CIO survey report directly to their CEO, 61% have direct interaction with the board, and 76% are interfacing directly with customers. As CIOs are playing an extended role in the business, the function of IT is also flexing to become more strategic and business focused. To make room for this expanded responsibility, IT organizations are undergoing efforts to optimize traditional IT operations and services—with a focus on increasing agility, reducing costs, and maintaining security. Organizations are also looking to empower employees with a more connected and holistic approach to managing access while protecting corporate resources. This focus on greater agility and better experience for employees, while maintaining security and holding down costs, is one of the key drivers of Enterprise Mobility + Security’s (EMS) market success. EMS has rapidly become a leading choice because it delivers what customers tell us they need most to transform their businesses – a comprehensive yet flexible born in the cloud service that meets a broad set of mobility and security needs in an integrated way. EMS led on bringing identity and access management together with mobile device and application management. EMS has kept pace with industry shifts and customer feedback by incorporating new security solutions such as advanced threat analytics and cloud access security. EMS has also shown it can reduces overhead by addressing customer needs in one place; avoiding the pain of integrating point solutions from many different vendors. 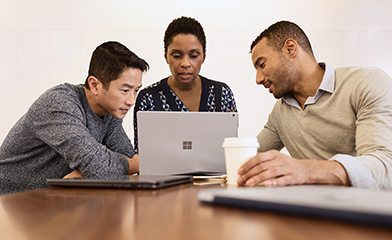 Over the last few months, we have turned the dial further and introduced new administrator experiences for Azure Active Directory, Microsoft Intune, conditional access, and Azure Information Protection in the new Azure portal. This collective move delivers a unified admin experience for these core EMS services that boosts IT Pro productivity and helps you get more out of EMS. The new console simplifies the configuration and management of powerful cross product workflows, such as conditional access, allowing you to define complex access management policies across Azure AD and Intune within a single interface. It also delivers deep integration with Azure Active Directory groups, which can represent both users and devices as native, dynamically targeted groups that are fully federated with an organization’s on-premises Active Directory. Identity is at the core of mobility strategies and we often find our customers first workload to deploy is Azure AD. This new environment makes it easy for you to scale your Azure AD groups and policies to protect at deeper levels using Intune and Azure Information Protection. Let’s say you defined a set of Azure AD and conditional access policies to protect your Office mobile apps, you can now easily find your way to Intune to set device and app protection policies to ensure your data remains protected even after it’s been accessed. From there, you click into Azure Information Protection to set encryption policies that protect your data no matter where it travels. You can even create a custom dashboard in Azure that allows you to monitor and control everything at a glance from any device. Our goal with EMS has always been to empower IT with a holistic and innovative set of tools that protect at the user, device, app and data levels without compromising productivity – streamlining management of mobility and security workflows in the process. This is the driving force behind our move to a unified EMS admin experience, and we are sure that your IT organization will reap the benefits. Moving forward, we’ll release all new features and enhancements for Azure AD, Intune and Azure Information Protection within the new experience on Azure. You can check out our new admin experience by logging into the Microsoft Azure portal today.